This simply represents everything we loved about those unimaginable zero summers at the beach acting like obnoxious fools while under the influence and playing our Young Fresh Fellows, Cramps, Suicidal Tendencies, Jam and Dead Milkmen songs too loud. 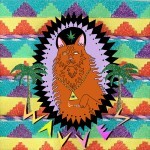 Wavves are just off a tour with Best Coast and tomorrow head to Japan and Australia. Today the band unveiled the second official music video from last summer’s King of the Beach (Fat Possum) and it happens to be the title track — directed by Focus Creeps. Watch frontman Nathan Williams and pals as they get high, play video games, eat food, make ridiculously cheap-looking counterfeit money, get tattoos, buy cheesy bling and wear crowns to the beach. Dig it.